Hey, welcome back! Am I saying that to myself? It’s only been a little over a year and here I am with a brand new genre video! Now *that* is some kind of work ethic! I couldn’t wait to have a new video to share with my students to get them excited about the thrilling world of genre study. For hesitant readers, sometimes the battle is as much knowing what you might like as it is fluency and comprehension. When the desire to explore a certain type of literary world is lit, reading skills and independent reading levels won’t hold a student back. They want in! That’s why I love talking about genre with students. It’s like window shopping. Take students on a journey of what’s out there for them to enjoy, and turn them loose to choose their own diverse, authentic texts. And when students choose what they want to read, they never stray far from fantasy. It’s the great grandaddy genre of all fiction. When pre-literate societies sat around explaining the world, spreading information, and entertaining others around the proverbial ol’ cave fire, they invented fantasy. Gods, goddesses, goblins, and ghosts. The first few graphic novels popped up on those cave walls, too. Lotsa superhero stuff. Things haven’t changed much. When you think about what children love (and therefore, what we all love) about books and stories, the most popular and lasting works are usually some kind of fantasy. The Wizard of Oz. Harry Potter. Star Wars. Charlotte’s Web. The Hobbit. The Lion, the Witch, and the Wardrobe. They provide myth and escape, sure. But at the core of all the imagination and magic is real human (or human-like!) joy, suffering, trial and triumph. The names have been changed, but the problems are real. The video lightly touches on the difference between fantasy meaning *every* story with something imaginary, and modern/contemporary fantasy, which is usually understood to be other worlds with elements of magic. There’s lots of hairs to be split. I threw in high and low fantasy, too, which can be endlessly argued. While it’s good to be a bit familiar with those distinctions, it’s best left to Internet forum nerd battles. Young readers just need to know that fantasy is magical — for many reasons — and it’s fun and okay to love! I LOVED the your sci-fi video! Such a clear explanation and Legos are always a great choice!! Beyond excited to see you’ve added a fantasy video. Looking forward to many more genre videos to come. Love your two genre videos! Well written and excellent production. I hope you will continue with mystery, historical fiction, and realistic fiction, at the very least. Your two videos on science fiction and fantasy are super! My students and I really enjoy them and have learned from them, too. Will you make more for other genres, please? 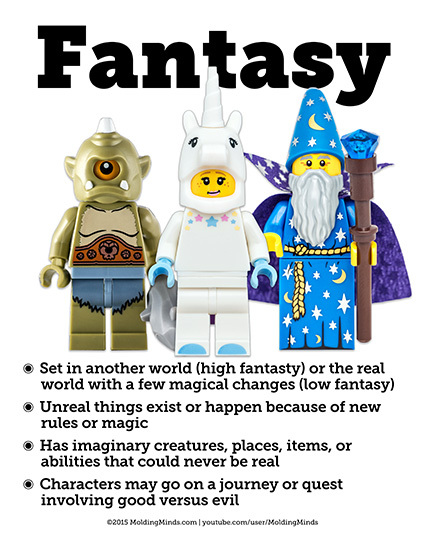 I’d like to see a copy of the fantasy genre poster, but the link doesn’t work any more. Would you mind emailing it to me? I am an instructional designer for Teacher’s College at Western Governor’s University and I would love permission to use these videos in course we are redeveloping on Children’s Literature. They are extremely well done and informative! I am also curious to see the PDF poster’s that you mentioned but I get an error when I click the link. If you would be able to send them to me via email or update the link on your site- that would be greatly appreciated and please let us know if images like the poster (if it is as relevant and aligned to the course content as your video) could be used in the course as well. I can’t get the one-page poster that goes with the fantasy video. Any advice? Make more genre videos!! They are AWESOME!!! Please make more genre videos! I love using these with my elementary students!